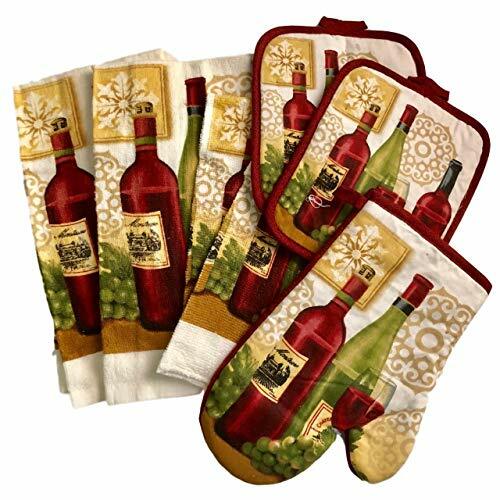 2 Kitchen towels, 15 inch by 25 inch, absorbent 100% cotton terry. 2 dishcloths, 12 inch by 12 inch, 100% cotton terry. 2 potholders, 6.75 inch by 8 inch with hanging loop at top. One oven mitt, 7 inch by 11 inch, protects arms from oven heat! All bundled together for a practical and colorful gift! 2 Kitchen towels, 15 inch by 25 inch, absorbent 100% cotton terry. 2 dishcloths, 12 inch by 12 inch, 100% cotton terry. 2 potholders, 6.75 inch by 8 inch with hanging loop at top. One oven mitt, 7 inch by 11 inch, protects arms from oven heat! All bundled together for a practical and colorful gift! If you have any questions about this product by E H, contact us by completing and submitting the form below. If you are looking for a specif part number, please include it with your message.